Gustav Svensson has seen the world — good and bad — in his soccer career. Sounders midfielder Gustav Svensson has dealt with situations far more difficult than filling in at less-than-familiar defensive positions. Back in 2014, Swedish import Svensson, 30, was playing for a team in the Crimea region of Ukraine when it was annexed by Russia. He’d lived for two years in the city of Simferopol, a short drive from the Black Sea coastline, enjoying a spacious apartment where he could stroll to the center of town for coffee, or meet friends he’d come to know there. One day, gun-toting pro-Russian militia members showed up, taking over city facilities, the local airport and even putting snipers on rooftops. Despite their ominous presence, Svensson’s wife, Sara, still his girlfriend back then, came over for one of her regular visits from Sweden, as did his future in-laws. Chris Wondolowski scored in the 90th minute, lifting the San Jose Earthquakes to a 1-1 draw with the Sounders on Saturday night. Wondolowski’s 11th goal in 19 matches against the Sounders deprived Seattle of a rare win in San Jose. Seattle (1-1-3) has one win in 10 trips to San Jose (2-2-1). Marco Urena’s deep cross found Wondolowski unmarked in the box for the easy conversion, his second of the season. The evenly matched game seemed destined for a scoreless draw before Clint Dempsey earned a late free kick. 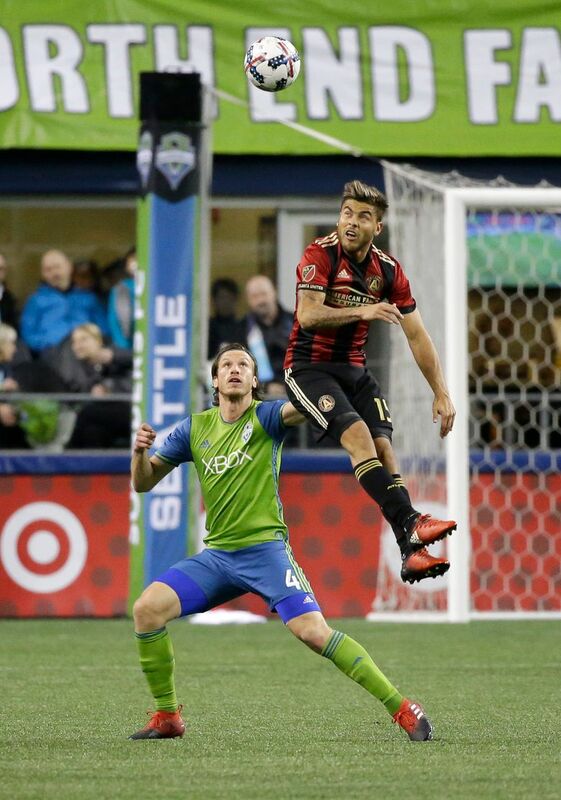 Dempsey’s attempt went off the wall but the ball rebounded back to Nicholas Lodeiro, who volleyed it over three charging defenders into the net in the 84th minute for his second goal. The teams combined for 32 shots, three apiece on target. After a “friendly’’ game at his Sports Club Tavria team headquarters, Svensson found he had hundreds of missed calls and texts. It turned out Russian President Vladimir Putin had declared his intention to send in his country’s military. Svensson, fearing for his and his girlfriend’s family’s safety, demanded the team immediately arrange a car service to get them out of the region. The team did just that the same day, but then, about a half-dozen of his foreign-born teammates — who looked up to the older, more-seasoned Svensson — asked if they and their families could join him. Realizing the car was too small, Svensson pushed the team to arrange a bus for all the families, accompanied by security personnel. They left on a 7½-hour drive out of Crimea and to the Ukranian city of Donetsk, where they planned to then fly home to their respective countries. But before the bus could exit Crimea, it was pulled over in the darkness at a militia checkpoint. Heavily armed men boarded the bus, shining flashlights in their faces and demanding their passports and travel plans. “It was pretty scary,” Svensson said. The team’s security personnel eventually calmed the militia members and the bus continued on. But those moments, with the biggest guns he’d ever seen pointed at their group, is something Svensson says will never leave him. Svensson until then had always quickly adapted to unfamiliar situations, beginning at age 13 when his family moved to Cannes, France, for nine months while his doctor father commuted on a work contract between that city and Sweden. In France, Svensson, his younger brother and two older sisters learned a third language to go with Swedish and English. They’d occasionally glimpse movie stars out walking during the city’s famed international film festival. Svensson also played for the Le Cannet-Rocheville junior soccer program. It was a taste of life abroad that would follow his professional soccer career. When his family returned to Sweden the following year, Svensson began playing for IFK Goteborg’s junior program. He was also a budding tennis star — in the nation that spawned Bjorn Borg — and the sports often collided for him. He settled on soccer and in 2005, at age 18, turned pro with IFK Göteborg, winning the Swedish title two years later and securing his first international cap in 2009. But the travel bug beckoned and in 2010 he signed with defending Turkish league champion Bursaspor in Bursa — about 100 miles from Istanbul — teaming there in 2011 with Toronto FC star Jozy Altidore. Later that year, they traveled to Istanbul to play Fenerbahce SK in front of a crowd of nearly 45,000 — consisting only of women and children under age 12. The Turkish football federation had banned men from attending several games in an attempt to curb hooliganism and violence. Svensson didn’t notice any drop-off in the crowd’s enthusiasm. “I think that’s the only place in the world where you can fill a 45,000-seat stadium with just women and children’’ he said. “The only difference that I remember is they scored a goal that was clearly offside. I mean, the play had stopped but the ball rolled into the goal. And the fans — the women — kept screaming like it was an actual goal for five minutes. Svensson headed to Ukraine in 2012, hoping to partake in a higher level of soccer. After fleeing the Russians two years later, he’d hoped to return once things calmed. But he quickly realized that wasn’t possible. So, he re-signed with IFK Göteborg until, after two seasons, wanderlust kicked in again and he left for Chinese Super League team Guangzhou. Svensson played in all 33 games, starting 28, for Guangzhou last season, but a January rule change limited teams to three foreign players instead of four. He became the odd-man out. “It’s a strange feeling going from being a starter one day to being told you can’t play,” he said. His good friend from Sweden, former Sounders midfielder Erik Friberg, came to the rescue. He suggested the Sounders, vouching for the Major League Soccer style of play — which appealed to the physical Svensson — and the city. Svensson was supposed to play mostly off the bench. But he insists he’s always prepared to start. He and his wife and son, Charlie, almost 2, have adapted to Seattle as well. Svensson likens it to Gothenburg for its waterfront, climate and food.